This small vineyard producing Chardonnay, close to our beautiful guestsrooms in Burgundy, gives one of the white wines of unparalleled minerality among the most famous in the world. This micro area around Chablis, is a great appetizer before discovering the rest of Burgundy. A paradise for epicureans in an undulating landscape of great sweetness. Petit chablis, chablis, chablis premier cru, chablis grand cru, the rarest and most prestigious, from steep hillsides overlooking the right bank of the Serein. Chablis is a word that you must relish and a village where you can just as easily lose yourself. To understand the history of the place, make sure you visit the Pontigny Abbey, some 15 km to the North. Cîteaux Abbey’s 2nd daughter house, this abbey was founded in 1114 on the initiative of a priest from Auxerre. 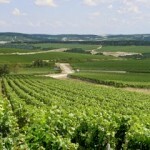 It was thanks to its monks that the Chablis vineyard was developed from 1130. At the time the vines provided a quaffable communion wine. Today we can still admire the storehouses and the presses. It is undoubtedly from the north that the vines and wines entered Bourgogne, in the Gallo-Roman Times. But its roots are much older: the vineyard is positioned on geological foundations of the Superior Jurassic era: the Kimmeridgian. Carpe Diem beautiful guestsrooms in Burgundy. Colette L . D. de Paris – France . Jean Marc et Anne Marie G. de Bruxelles – Belgique. Anne, Sébastiana et Philippe D. de Poitiers – France. Nous sommes venus, revenues et reviendrons! Carpe diem …ainsi furent ces deux jours de paix, sérénité. Paul et Françoise C. Belgique.